You don’t have to own an expensive robot to do cool stuff, all you have to do is make the most you can out of what you have. 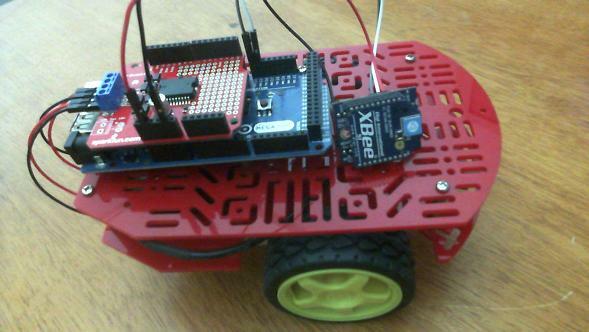 In this tutorial I will use the popular, yet affordable, Magician Chasis robot and make a wireless controller for it using XBee and LabVIEW. More than likely you want to see a video of this beauty before you even try to run the code right? then here it is. We have a transmitting XBee and a receiving one. The transmitting XBee is just connected to a USB port in my laptop. You can download the robot interface LabVIEW VI from here. 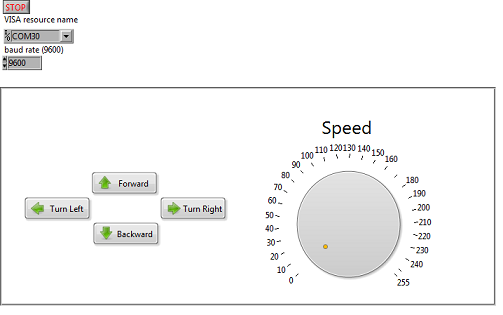 The control consists of five inputs, four of which are the directions (left, right, forward, back) and the last one is the speed. The directions are booleans (0 or 1) and the speed is numeric and goes from 0 to 255, the latter controls the 8 bit ( 2^8-1 = 255 ) PWM wave from the Arduino. You also have to set up the XBee serial communication parameters: what COM port your XBee is connected to and what speed. Make sure you click refresh from the drop down menu in the interface when you connect the XBee, otherwise the port might not appear listed. I used the Arduino Mega for this project. If you are using the Arduino Uno or an Arduino that has only one serial port set of RX and TX pins, replace Serial3 with just Serial, also disconnect the XBee while you are uploading the code. Alternatively you can use the SoftwareSerial library to create RX and TX pins in pins other than 0 and 1, this way you will be able to use the built in serial to debug your code.